Sometimes you find yourself enjoying a particular winery's offerings so much that you add them to your list of future wine destinations. Sometimes you realize that for the last 10 months you've lived only 20 minutes away from that winery. And sometimes you actually visit that winery and then remember that was over a month ago and realize you are one of the world's worst online beverage journalists. The particular winery I'm referring to is one we've written about a few times; Sokol Blosser. 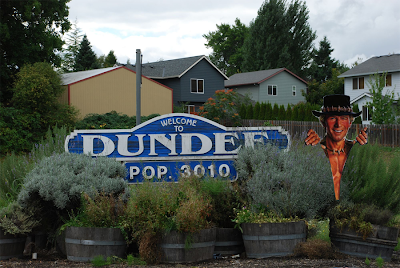 I had driven through Dundee before, but for various reasons had never stopped to enjoy its plethora of wineries. Located along highway 99W, it is a quick trip for almost anybody living in NW Oregon and gets plenty of casual traffic. Josh happened to be in town and to make the best of it, Alyssa and I decided we were going to check it out. While there are many world-renowned wineries in Dundee, we specifically decided to visit Sokol Blosser first. Long time readers of West Toast will recall that we've reference their Meditrina and Evolution blends quite a few times. Usually we do so in order to make the point that you can use either to pair with pretty much anything (like Voodoo Doughnut Bacon Maple Bars and Dave's Killer Bread Sin Dawgs). That said, and as good as enjoyable as those wines are, we didn't come out to Dundee to taste what we've already had. Sokol Blosser also happens to make a variety of other wines and we were determined to try as many as we could. Upon entering their tasting room, we were met by Eddie Zavestoski. Originally hailing from San Diego, Eddie heard the call of Pinot Noir and migrated to the Willamette Valley. Now entrenched in Pinot Noir, Eddie gets to share that passion and knowledge with random food and beverage journalists like ourselves. 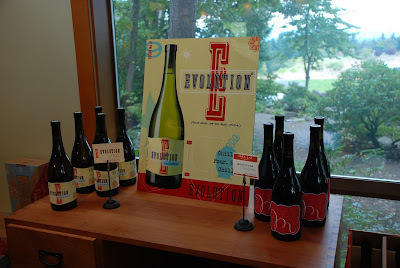 After tasting through a dozen or so wines, it became abundantly clear that if one's only exposure to Sokol Blosser is through Meditrina or Evolution (which apparently accounts for 2/3 of their annual sales), you are sorely missing out. While some wineries go out of their way to make wines that push the boundaries of what a certain varietal should taste like, "classical" would be the best way to describe Sokol Blosser's approach. Nothing pushes your palate's boundaries, but instead each vintage reminds you why you appreciate it in the first place. Before we got to reds, I was pleasantly surprised by both their Müller-Thurgau and Willamette Valley Pinot Gris. Then came the Pinot Noirs. If you couldn't tell by this point, Sokol Blosser takes Pinot Noir seriously. We must have tried around five different Pinot Noirs and each were spot-on reflective of the year they were harvested and the conditions of the time. All were very balanced, classical in their approach, and fit the profile of what a superb Pinot Noir should be. One, however, especially stood out as one of the best Pinot Noirs we had ever had. Their Goosepen single-block estate Pinot Noirs are very small in production, but make an enormous statement on your palate. Flavors of cola, chocolate, and black cherry fuse together in creating one of the smoothest, most complete Pinot Noirs I've had to date. After our tasting was complete, it was time to take a tour of the vineyard and barrel room. 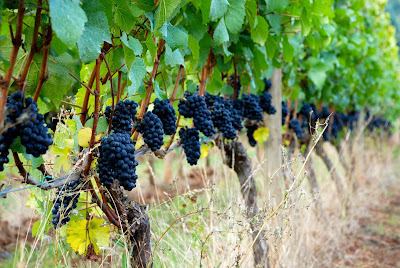 Because of Sokol Blosser's 30+ year history, the vineyard is essentially a living story book. Episodes of devastated crops, experiments with geese, and rotated varietals in different blocks make their tour one of the more interesting in the Northwest. You can register for one of these tours yourself and spend about 45 minutes taking and sipping with folks like Eddie. Don't feel like walking? They've got you covered! With the assistance of a 7-person ATV, you can off-road your way through the tour of a lifetime. Adding to their history of achievements, Sokol Blosser is also home to the country's first LEED-certified winery building. 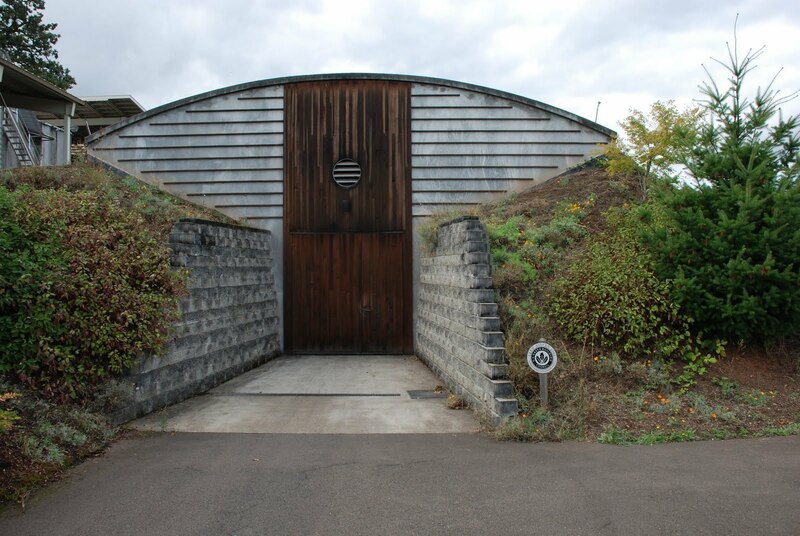 Built in 2002, Sokol Blosser's barrel room is a multi-chambered bunker of deliciousness and dedication to sustainability. A huge thank you goes out to Eddie as well as everybody at Sokol Blosser. Do yourself a favor and either stop by the winery or pick up one of their single varietals next time you're wine shopping. While I wouldn't suggest Josh try pairing his bottle of 2008 Goosepen in the same manner we used Meditrina, I have a feeling we'll come up with something. Hey, did some yahoo sneak into our picture?